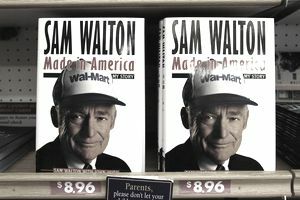 When Sam Walton was working his first "retail" job as a young boy, selling milk from the family cow door-to-door, it's unlikely that he had an idea that nearly a century later people would be googling "best Sam Walton quotes" in order to know what a kid working a milk route thought about retail competition, leadership, and the global retail phenomenon that we all know as the Walmart business. No collection of quotations from famous retail leaders and U.S. retail industry founders would be complete without the quotable quotes from Sam Walton, who is arguably the most famous of the famous retail CEO rock stars. When Sam Walton opened Walton's Five and Dime in Bentonville, AK, it wasn't just the start of a retail business, it was the birth of a retail empire. Today the Walmart chain of retail stores has a global reach and the Walmart corporation is the largest retail company in the world. These quotes from one of history's most famous retailing leaders and legendary retail icons will reveal what Walton was thinking and learning about the retail business as he was building the world famous Wal-Mart discount retail chain in the U.S.
"I probably have traveled and walked into more variety stores than anybody in America. I am just trying to get ideas, any kind of ideas that will help our company. Most of us don't invent ideas. We take the best ideas from someone else." "The two most important words I ever wrote were on that first Wal-Mart sign, '‘Satisfaction Guaranteed’. They're still up there, and they have made all the difference." "The secret of successful retailing is to give your customers what they want. And really, if you think about it from the point of view of the customer, you want everything: a wide assortment of good quality merchandise; the lowest possible prices; guaranteed satisfaction with what you buy; friendly, knowledgeable service; convenient hours; free parking; a pleasant shopping experience." "I guess in all my years, what I heard more often than anything was: A town of less than 50,000 population cannot support a discount store for very long." "There's a lot more business out there in small town America than I ever dreamed of."